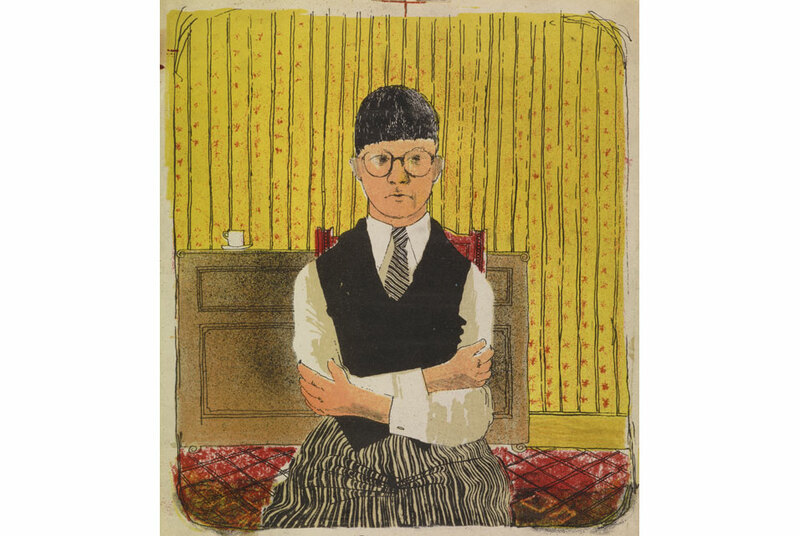 David Hockney, Self Portrait, 1954, Lithograph in Five Colors, 11 1/2 x 10 1/4″. Edition: 5 (approximately) © David Hockney. Retrospective of Hockney’s 60 years as a printmaker opens at Dulwich Picture Gallery. LONDON.- Timed to coincide with the 60th anniversary of David Hockney’s first print, Dulwich Picture Gallery will present a major exhibition celebrating the artist’s long and diverse career as printmaker. David Hockney, Britain’s best known and arguably best loved artists, is also one of our most talented printmakers. Showcasing over 100 works between 1954 and his more recent work with computers in 2009 Hockney, Printmaker will open Dulwich’s 2014 programme, looking beneath the highly engaging surface of his graphic work to reveal the thought and expertise that underlies it. Grouped by theme and technique in a series of displays, the exhibition will give an instructive and entertaining overview of the artist’s career and reveal aspects that some observers might not be familiar with, such as the importance of poetry and classical literary sources as a basis of many of his projects, and his extensive knowledge of the work of fellow printmakers throughout the ages. Curator Richard Lloyd said: “This exhibition will provide an insight into an aspect of Hockney’s work which is often overlooked – that he is one of the most prolific, diverse and technically astute printmakers alive. Concentrating on Hockney’s two main print techniques – etching and lithography – the exhibition will feature early etchings done whilst a student at the Royal College of Art, including a complete set of ‘A Rakes Progress’, the suite of sixteen etchings that dramatically announced his arrival on the art scene in the early 60s, and three early, extremely rare lithographs including ‘Self-Portrait’ from his time at the Bradford College of Art. Also included will be ‘The Weather Series’, Hockney’s large-scale lithographs inspired by the stylised depiction of weather conditions in Japanese Art, and ‘A Hollywood Collection’ a cheeky ‘instant art collection’. Both of these were the fruit of his trips to California in the 1960s. The exhibition continues with his ‘Home Made Prints’ which Hockney devised in 1986 using photocopiers, and ends with two important printed computer drawings – one of which is Rain on the Studio Window – related to the artist’s experiments with iPad and iPhone. Portraiture has been as important to Hockney in his graphic work as it has in his paintings and drawings, and just as in these other media he has concentrated on a small group of close friends. The show will feature portraits of the designer Celia Birtwell, the restaurateur Peter Langan and the critic and curator Henry Geldzahler. These works stem from his desire to create a psychological as well as a physical likeness, something Hockney feels is only possible when he has an existing relationship with the sitter. Hockney’s dislike of repetition and routine explains the enormous diversity of his output as a printmaker. However, throughout his career he remained faithful to the two main printmaking techniques of etching and lithography. In retrospect we can see that the 60s and 90s were dominated by his work in etching, whilst the 70s and 80s were largely given over to lithography. Working closely with master printers such as Maurice Payne, Aldo Crommelynck and Kenneth Tyler he learned an enormous amount about the craft of printmaking. These skills he put to use constantly striving for new effects and new modes of expression. The exhibition is curated by Richard Lloyd, International Head of Prints & Multiples at Christies. Loans have been secured from key lenders including Salt’s Mill, Saltaire, David Hockney Inc., David Hockney Foundation, National Gallery of Art, Washington, National Gallery of Art, Canberra, Bradford Museums and Galleries, Tate and Private Collections. A fully illustrated colour catalogue published by Scala accompanies the exhibition and features an essay by Richard Lloyd. It will explore the key themes in the exhibition in the context of the artist’s biography, together with illuminating texts from contributors such as Marco Livingston, John Kasmin, Peter Tatchell, Celia Birtwell, and Martin Gayford.